A Tatar Woman of Kusnezk. Home » A Tatar Woman of Kusnezk. 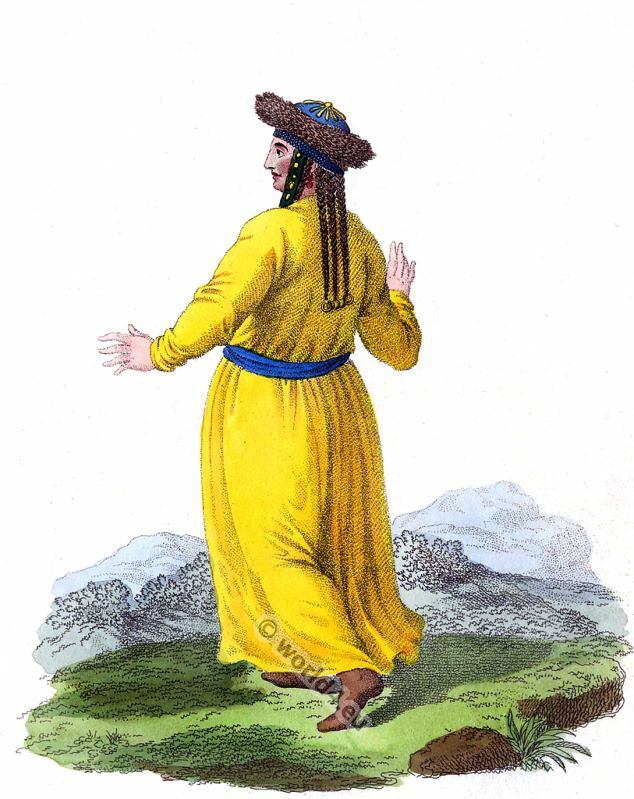 A Tatar Woman of Kusnezk 1803. Une Femme Tatare de Kousnetzk, par derrière. THE Teleutans, or Telengoutes, known by both appellations, apparently derive their name from the Telengout lake, near the Ob. Although they are not a nation purely Kalmuc, the Russians call them White Kalmucs either from their coining from the White Mountains, from their being of a lighter complexion than the other wandering nations, or, because the word ” white ” sometimes signifies free. Subject, however, to the Zungarians, or to other Kalmuc hordes, they were far from enjoying freedom. Towards the middle of the last century several of their tribes wandered as far as Kousnetzk, and became the subjects of Russia. A trifling tribute secures them the tranquillity they now enjoy. The remaining tribes continued under the Zungarian yoke, and were afterwards involved in the ruin of that people. The Teleutans, whom Abulgasi classes among the Kalmucs, bear a strong resemblance to that nation, and also to the Tartars. They are idle, in-different, and insensible; their understandings are extremely limited, and totally without cultivation; it is difficult to make them comprehend the most simple subjects. Bread, cattle, children, and the supreme happiness of doing nothing, are all they desire: they, therefore, live in perfect harmony with each other, and pay their tribute to the Russians without murmuring. Divided into small tribes, marrying with each other, the Teleutans, subject to Russia, are scattered over both banks of the Tom, and the rivers running into it. At the time of’ their establishment in the territories they now occupy, the Teleutans were a nation of wandering hunters and pastors; but the example of’ Russia and a confined territory engaged them to construct permanent habitations, and to turn their attention to the cultivation of the soil. Their mountains contain a great quantity of game, and of animals valuable on account of’ their furs. The Teleutans are fond of the chase, and their cattle, not very numerous, leave them sufficient time to follow that diversion. Their villages seldom contain more than ten houses: their summer dwellings consist merely of poles struck into the ground, and covered with matting or the stalks of peas. These mats serve them for coverings and carpels. Both rich and poor sit, eat, and sleep upon benches. Their dishes are all of wood, and they have scarcely a sufficiency of cast iron to make boilers for cooking their provisions.